It seems like people are writing less and less, some prefer to even type up quick memos instead of jotting them down on a post-it note. For those that still prefer to write things down on normal paper, there’s a new writing utensil out there. 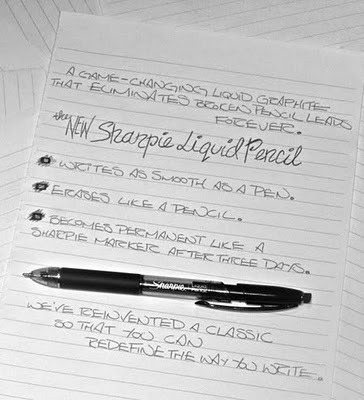 Sharpie has come out with an interesting new pencil, that mimics pens by being liquid. We already have erasable pens and mechanical pencils, I suppose this was the logical next step. We just couldn’t keep writing in the same way that other generations did 50 years ago. These Sharpie pencils will allow for you to erase your work up to a certain point. After it’s been sitting for over 3 days you won’t be able to erase it, but for at least a little while you can. These are already making their way to Office Depot just in time for the back to school frenzy of shopping.